The prime purpose of my trip to London last month was to visit the home of Twinings and experience a tea tasting of both new and old. The Twinings shop on the Strand was a particularly apt venue to sip tea in, as it was the very first establishment in England to start serving tea back in 1706. This bold move was the inspiration of one Thomas Twining, a coffee house owner and trend setter of his day. Despite various difficulties encountered along the way, including a high tea tax and opposition from beer and coffee providers, tea drinking soon took off and by the 1750s had become the British drink of choice. Arriving at Paddington Station from Cornwall, the easiest route to Twinings seemed to be to take the tube to Charring Cross and take a stroll along the Strand. Not only did this give me a nice walk, but it was a chance to wander down down memory lane as well. As a student in London I was very familiar with this area. Charring Cross was where one of our prime bookshops was located and obviously, being a keen student, I frequented it regularly 😉 For a while I commuted from Charring Cross station and got to know it rather more intimately than I might have wished. To avoid the rush hour fight for trains, I’d often go and while away half an hour or so in the National Gallery. It’s many years since I’ve visited this august institution, so I made a mini detour to have a look around. It seemed as though nothing had changed. Walking along the Strand, I couldn’t help but glance cheekily at The Strand Palace Hotel on the other side of the road. We had many a time filled up on the cheese and biscuits there, which were plentifully supplied along with an apple for a ridiculously small sum. What others ended their meals with was a meal in itself for us. When I arrived at 216 the Strand, I found I was one of a small but select group of tasters and was particularly pleased to discover that Fiona of London Unattached was in attendance as well as Caroline of All that I’m Eating. The shop is long and narrow and steeped in history and packed to the gunwales with tea and tea making paraphernalia. I urge you to have a look at the pictures online as mine were less than perfect – hey ho, the joys of iPhone photography. The shop also contains a small museum which is worth a look if you are passing by. At the back is a tasting bar, where you can sample your tea before you buy – now what a fabulous idea that is. For the more adventurous, you can book a tea tasting for around £30 at one of the regular events. Having established that my preference was for green tea, I was offered a freshly brewed cup of Jade Pillars, a refreshing tea with floral notes that went very nicely with the chocolate tart I chose from the accompanying plate of patisserie. Whilst we were sipping our welcome cup and munching on the tarts, we were welcomed by Stephen Twining, a 10th generation member of the Twinings family; he is still involved in the business, although it is now owned by Associated British Foods. He told us a little about the history of tea and the family business, which I found really interesting. Some of it I knew, but much of it I didn’t. I learnt for instance that China tea was our mainstay until 1838 when cheaper Indian tea started to be imported into the UK. Because of the high tax on tea, smuggling was rife and much of the tea that made its way to the British cup was adulterated with dried leaves and twigs. Richard Twining was instrumental in getting the tea tax substantially reduced in 1774 which effectively put an end to smuggling. In 1837, Queen Victoria granted Twinings the Royal Warrant for tea. Feeling suitably steeped in the historical aspects of tea, we then had a session with two master blenders. It takes five years of training to reach this dizzying height and as a mark of achievement the blenders receive an engraved tea spoon of which they are justifiably proud. Traveling to plantations and sourcing teas from around the world is another of their rewards. Twinings take their tea blending very seriously indeed. Whilst excellent single origin and premium loose leaf teas can be bought at the shop or online, the teas that most of us drink on a daily basis need to be consistent, both in taste and quality. Every batch of tea is tasted at least seven times before it is packaged and sent out for sale. I quizzed Philippa on the best teas to be taken with chocolate and she gave me such a fulsome answer I didn’t have time to write it all down. The essence of it is as follows: Assam for milk chocolate, strongly flavoured teas such chai for dark chocolate and Darjeeling for afternoon chocolate indulgence. 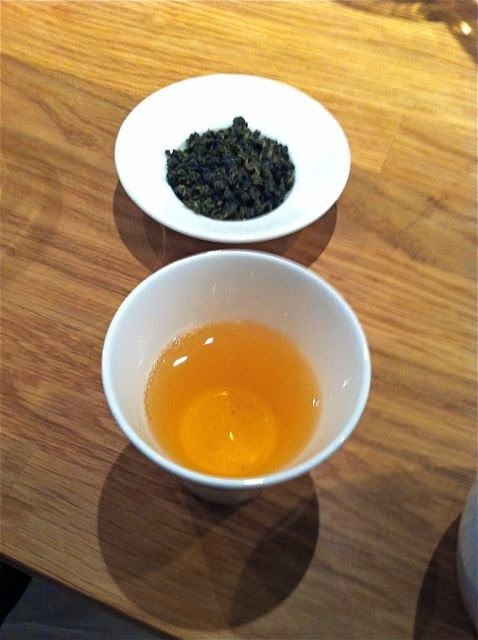 We started our tea tasting with a semi fermented oolong from Taiwan. We could see the large leaves unfurling in the glass teapots as the tea brewed. This was highly perfumed and quite delicious; I would have been happy going no further in my tea journey that day. I’m glad we did though as I think the second tea was even more irrisistable. This was a first flush Darjeeling. Although a black tea, this is fine and delicate and like the oolong is best drunk without milk. Darjeeling has a high price tag as it accounts for only 1% of the world’s tea. It has two harvests per year with the first flush being the cream of the crop. It tasted like it. We went on to taste keemun, a Chinese black afternoon tea which again is best drunk without milk. The last black tea we tried was a second flush Assam. In contrast to the Darjeeling, the first flush is best avoided and the second is the one to go for. This was smooth and malty and would be good with or without milk. Innovation continues to be at the heart of what Twinings does. Realising that many people wish to drink green tea for its health benefits, but find it heard to accustom themselves to the taste, they have come up with a new range of sweet greens. Despite the name, these teas have no added sugar or other sweeteners but have an air of sweetness about them and do not taste bitter. Being a bit of a purist, I’m not normally a fan of flavoured teas, so was a little sceptical. We tried the caramelised apple first, which with added cinnamon and apple flavour smelt exactly like apple crumble to me. I was surprised to find that I didn’t dislike this tea and in fact didn’t dislike any of them. Salted caramel was next. The name alone makes this hard to resist and it actually tasted quite pleasant. I drink a lot of ginger tea, but the gingerbread tea smelt and tasted nothing like my familiar brew. The aroma was quite nostalgic and reminded me of old fashioned ginger cake. It is recommended that these teas are brewed for only two minutes which seems very sensible; in my experience less is more when it comes to green tea. Interestingly, my mother who would like to drink green tea, but doesn’t like the taste has found these new flavours quite palatable, so game set and match to Twinings. When we thought we might have had our fill of tea for the afternoon, out came the cocktails. We quickly realised we could very easily manage a caramelised apple Martini made with green tea and vodka. Very tasty it was too. I’m not at all sure it was kind of Twinings to introduce me to the concept of green tea cocktails. When I got home, I had a go at creating a salted caramel chocolate cocktail and found I couldn’t stop drinking it. Chocolate and salted caramel are one of my all time favourite flavour combinations and this drink did not disappoint. The flavour of salted caramel was there without the drink being overly sweet and the chocolate melded well. After the tea tasting we were taken out for a late lunch at The Delaunay. Those more knowledgable than myself tell me this hotel is well known as a first class venue for business meetings. I didn’t clinch any deals, but I certainly enjoyed the food. I had my first tasting of pierogi, vegetarian Polish dumplings which were quite delicious. Needless to say I had a dessert and it just happened to be a chocolate one. A rather moreish cocktail made from green tea and chocolate liqueur. 1. Place the teabag in a teapot and pour 100 ml of near boiling water over it. Leave to brew for 2 minutes then remove the teabag. Leave to cool.2. Pour into a cocktail shaker together with the chocolate liqueur and ice cubes. Shake well and strain into two martini glass.3. Sip as slowly as you can. Many thanks to Twinings and Hill & Knowlton for a fabulous afternoon out. I was not required to write a positive review and as always, all opinions are my own. Looks like a good day Choclette, something completely different. I love twinnings tea, In my kitchen cupboards I have Winter Spice, Mango and a number of others, I’m a bit hesitant with the green teas, still now quite acquire the taste, but i have to say the Salted Caramel Tea is calling out my name; and I love the sound of the cocktail. Must seek it out. PS I’ve recently made some Polish Pierogi at home, will share soon. Choclette, so glad I found your blog this morning! I couldn’t resist a post about Twinings, one of my favourite teas. I prefer loose leaf black teas and am never without a large tin each of Twinings Earl Grey and English breakfast. Unfortunately, I can never find their Darjeeling in loose leaf (I’m in the US). So lovely to see you again Choclette. Your photos are fine! And, that chocolate thing at the Delauney looked really lush! I am a massive tea addict, only drink black and have 30+ in my cupboard. I have never used them in a cocktail though … I am inspired! I love that salted caramel tea. I have been having one in the evening to help with sweet cravings and finding that it really helps. Oh that sounds fabulous. Ilove twining teas – particularly their fruit blends. My favourite at the moment is blackberry and nettle but I am working my way throuhg lots. I’m very jealous of your tasting session. What a great experience, I love to taste different teas. I like green tea in leaf form but have found the tea bags a bit of a challenge, these sweet teas sound very interesting, worth a try. Wow this was a very good experience for you. Tea is always interesting as there are so many types with unique flavours. I think we are spoilt for choice these days. I love any type of tea, traditional or herbal, all of them. What an awesome experience! The tea cocktail with chocolate sounds fascinating. Tea is one of those things that you cannot get away from yet I don’t really like. Occasionally with traditional afternoon tea I will have a cup or two but generally I am a coffee type of girl! What an amazing experience Choclette and a fabulous post too! I am a HUGE tea addict and this would have suited me down to the ground! I would have loved to be pampered like this and taste the salted caramel tea. I am glad to know which teas to pair with chocolate. Luckily I already like Chai.